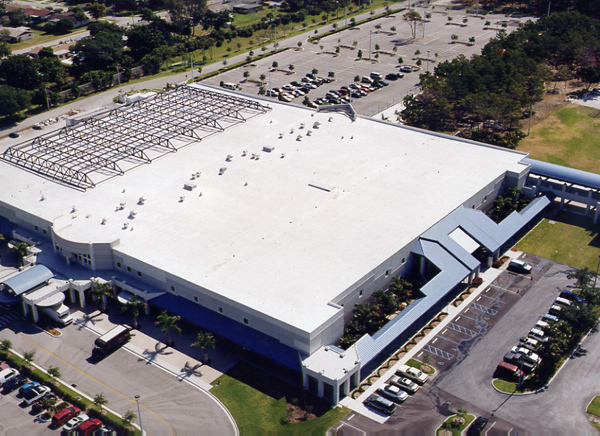 PSI Roofing was tasked by the church administration to find an economic but durable and reliable solution to solve ongoing leaks on their main sanctuary building including over 140,000 SF of flat roofs area. PSI Roofing’s estimating and sales team were able to provide a re-cover system option, significantly reducing the overall cost of the project, with the installation of a new Duro-Last Roofing PVC Single-Ply membrane roof system. The new commercial roof system included a 15 Year No Dollar Limit Warranty with a Consequential Damage coverage for up to $12 Million for a single event. Not only did the Fort Lauderdale community-based church receive a brand new roof; upon project completion, all its interior contents were covered by an insurance policy that is part of the warranty provided with this roof system. The roofing problem was resolved and the church leadership can rest assured that they can focus on their mission of helping and caring for people as their facility is now covered and protected. PSI is a strong supporter of the work of the ministry of Calvary Chapel in the Fort Lauderdale community and was proud to be part of this project.